We’ve had no shortage of activity lately, welcoming new friends into companionship as we bid farewell to those who traveling on roads that will lead them several states away. 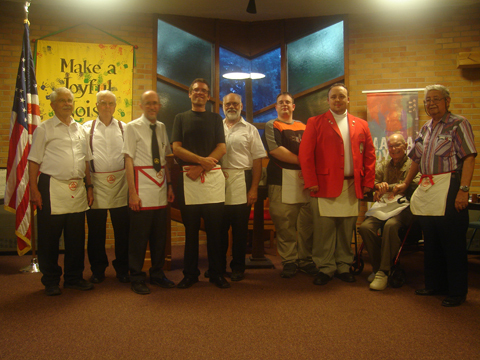 In July our King, George Lucero completed his move to New Mexico, and though he won’t be able to complete his term as Thrice Illustrious Master we presented him with his Past Illustrious Master’s apron. July was also Paul Howell’s last meeting with the Ann Arbor York Rite before he heads out to Arizona. Paul leaves enormous shoes to fill and in consideration of the amazing work he has put into supporting the York Rite in the Ann Arbor area and beyond the Ann Arbor York Rite bodies have awarded him the Ann Arbor York Rite distinguished service award. But as we wish these companions well on their journeys we welcome in our new companion, Jason Bryce into our chapter who received his Royal Arch Degree on the 27th at the Detroit Masonic Temple with help of Monroe Chapter No. 1. He certainly had to travel a rough road to get there, but we’re happy to have him with us. As usual there’s a subject I’d like to discuss this month. I’ve noticed that when I am talking to someone about Freemasonry and mention that I’m the head of a Chapter of Royal Arch Masons in Ann Arbor people tend to take it at face value. But there are times, especially when I begin to mention one of the Ann Arbor Lodges, or the fact that my Lodge is in Belleville, that I get a few follow up questions. Usually along the lines, of “Well I thought you said you were the head of the Masons, in Ann Arbor” and continuing with “So what’s a Royal Arch Mason then?” And I find that while I’m good at explaining Blue Lodge, and what Freemasonry is in general, I’m bad at explaining Royal Arch to someone without confusing them with details on our organizational structure or the nature of our work. Appendant bodies in general are a complicated subject. The whole idea of having these degrees and bodies that are considered higher yet at the same time equal and in many ways subordinate to Blue Lodge make for no short discussion. Military rank, or corporate structure serve as poor comparison, and Royal Arch is in all likelihood the most complex of the appendant bodies to explain given its position as a completion of the third degree, and the whole subject of the Antients and Moderns. I’ve always thought of a Royal Arch Mason as a curious Mason who is unsatisfied with substitution and has an interest in following the path that history has taken our craft. It may not be a simple explanation but when someone asks me why I joined the Royal Arch, going as far as to become a leader of a chapter I find myself driven to give them an explanation that simply says the craft lodges, give you a part of the story, and the Royal Arch continues it. Such a vague explanation may lead to more questions, on the Royal Arch and the initial story Craft Masonry tells, but if they want to know, I guess they’ll just have to petition a Lodge and find out. Now there are plenty of activities this month so remember to keep these things in mind. On August 15th we have our regular meeting, and among other things we will be ordering our new Ann Arbor York Rite polo shirts. The shirts are $25 and have two designs. One design featuring, Lodge, Chapter, and Council, and the other featuring Lodge, Chapter, Council and Commandery. You can order them at the meeting or just send me an e-mail at highpriest@aayorkrite.org specifying how many you want, which design you want and your size. I’m also working on making them available to buy online at http://aayorkrite.org but that will take a little time. On August 17th is Grand Chapter so if you’d like to come once again mention it at the meeting or send me an e-mail and we can ride together. August 28th is the Annual Ann Arbor Freemason’s Tri-Lodge Picnic at Gallup Park. I know I’ll be there and I’d love our members there out supporting Ann Arbor Freemasonry. And last but not least we are hosting the Southeastern Michigan York Rite Association meeting this month on August 29th with the aid of York Chapter at the Milan Masonic Temple. There’s plenty going on this month so make sure to mark your calendars and I hope to see you there!